They say that hindsight is always 20/20. As time goes by, we gradually gain the objectivity to interpret our experiences with clarity. We may reflect on our feelings, the lessons we learned, more importantly, how we handled the situation. I recently listened to a riveting audio book by renowned gerontologist Karl Pillemer. He conducted numerous interviews with men and women between the ages of 65 to 105 and asked them for advice on life topics such as relationships, career, parenting, happiness and avoiding regrets. It was both poignant and insightful to listen to the stories of pain, joy and struggle of these distinguished individuals who had lived through some particularly difficult eras in Western history, such as the Great Depression, World War II and the American Civil War. Yet they spoke with grace and humility while narrating the highs and lows of their lives. As I listened to their stories, I got a visceral understanding of the fleeting and fragile nature of life. In our youth, we’re inclined to seeing ourselves as omnipotent, and we never really consider the finiteness of our lifetimes. Acknowledging this truth will open us to a big picture perspective – we’ll be more inclined to make responsible and conscious decisions. Of course, no amount of preparation can prevent us from occasionally faltering along the way, but we’ll find it easier to bounce back because of our long view. The elders that Karl Pillemer interviewed admitted that there were a few things that they have regrets about, and they were keen on enlightening the youth of today on how to avoid falling into the same trap. Although they had feelings of melancholy surrounding their incidents of regret, you could tell that they were immensely grateful for having the opportunity to pass on their legacy before their demise. Regret is an unpleasant feeling that’s toxic to our wellbeing. If you have any regrets, it’s essential that you find closure by releasing the emotional charge behind it. This article provides some simple ways on how to release regrets. 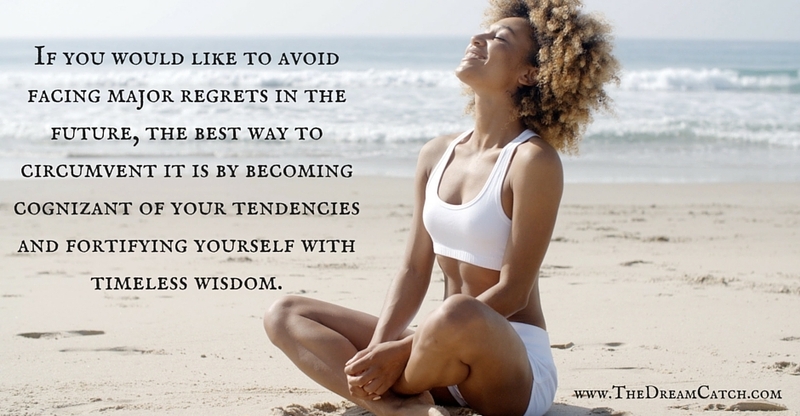 If you would like to avoid having regrets in the future, the best way to circumvent it is by becoming cognizant of your tendencies. 1. Tell the people who matter that you love them: As emotional and social beings, it is essential that we express how we feel to those we love and care about. Too many of us hold back from conveying our affections to others because we take our relationships for granted or we’re fearful of being vulnerable. We also want to avoid deliberately hurting others because, at the end of our life, our conscience will catch up on us for all harm that we’ve caused others.The Dalai Lama once said that our prime purpose is to help others and if we can’t help them, at least don’t hurt them. 2. Take sensible risks and get outside your comfort zone: Most of the elderly will tell you that they don’t regret what they have done but the things that they didn’t do when they had the chance. If we want to achieve great things in life, we can’t afford to be timid and settle for the status quo. We should be willing to step outside our comfort zone because that is where the magic happens. Prosperity comes to those who are willing to take chances and get comfortable with sensible risk taking. If you aren’t happy with where you are right now in your life, find the courage to alter your situation before you become apathetic. 3. Travel and explore the world: There’s a big, wonderful world out there, filled with adventure and stimulation. Nothing can broaden your perspective and make you feel connected to humanity and nature as traveling does. During our limited time on this planet, we want to strategically cover as much territory as possible, while keeping our domestic life and finances in balance. Many of the elders in the book emphasized on the rewards of extensive travel, and encouraged people to go off on foreign escapades early on and not wait until retirement years when there’s a chance of developing physical ailments and disabilities. 4. Live in the present moment: The strains of everyday existence can cause us to frequently slip into lapses. While it’s healthy (and even enjoyable) to reflect on the past and plan for the future in moderation. We want to be able stay within our limits so that we don’t miss out on the gifts of the present moment. We can extract all the goodness and wisdom from the present once we immerse ourselves into an experience and open ourselves up to the sensory pleasures on offer. 4. Don’t take life too seriously: Life is serious business and does require us to show up and give it our best shot. Yet we can’t deny that it is those tender and light-hearted moments that we will remember and cherish later on in our lives. Laughter and play is crucial to our overall wellbeing and a life well lived. Ensure that you allocate sufficient time during your week to engage in fun activities and spend time with the people who can bring out your inner kid and help you appreciate the humorous side of life. 5. Leave a legacy: At the end of your life, you want to be able to say that you left the world a better place. Perhaps you raised children who grew up to be responsible, moral and successful individuals. Maybe you founded a business that now provides jobs and supports numerous families. Or perhaps you championed a cause that was dear to your heart and your efforts were instrumental in creating positive change. The scale of your contribution doesn’t matter as long as it has your finger prints on it. Imagine yourself at the dusk your life, reflecting on your journey. In those moments, how would you like to feel about everything that has occurred? Perhaps this exercise will encourage you to be more bold and daring in your decisions and actions. My sincere hope is that it will galvanize you to move forward with your life with passion and purpose. Question for you: What are some things that you can begin to do today to avoid lifelong regrets later on in your life? Hello Seline! Thank you for sharing these tips with us. Far too many people live with regrets their entire lives and it ends up being what defines them. Everyone is human and everyone will make a mistake now and then and fail, but we cannot let those moments control us, destroy us, or define us. thank you for giving us ways to get back on our feet and continue moving forward. Great points Seline. I really enjoyed reading this.